Everything in this place is simple and unfussy - the interior is plain red and white, in a mid-century diner fast-food joint stylee. The menu is as bare as it could be. Even the font they use feels simple. They’ve arguably nicked some tricks from the Five Guys and In ‘n Out playbook (even to the point where bacon is available, but not on the menu), but then Portlanded it up to match the ridonkulously hip district it’s situated in. The burgers are strictly no-nonsense. And they are incredible. The first thing you notice is how fresh everything is: the lettuce is alarmingly crisp, the onions are uber-crunchy, the tomato is taut and full of flavour, the swiss was melty, but not greasy at all. 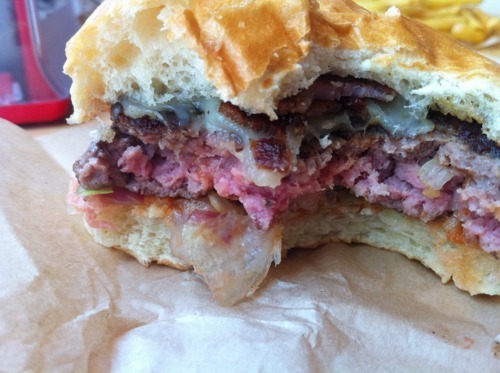 The patty was cooked medium to perfection; the meat was soft and seasoned well. 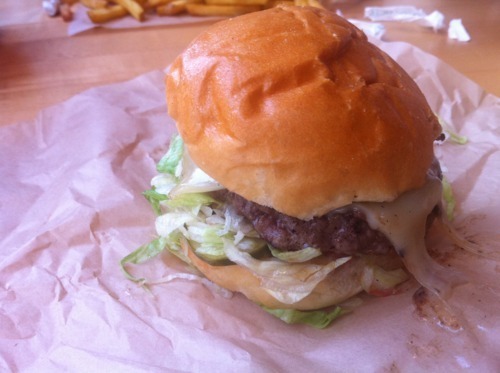 Even the brioche bun tasted like it had just been baked, and is exemplary. What made it all the more surprising was they used English style rashers for the bacon, something we usually frown upon at B/A, but in this instance seemed to work well. 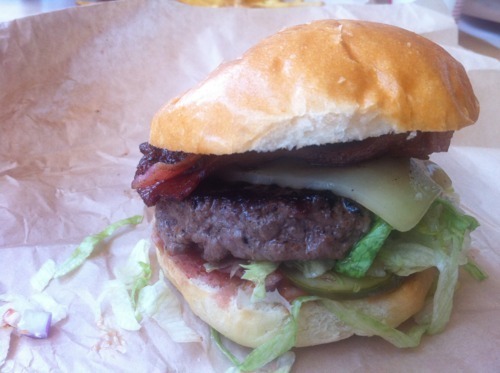 As did their take on ketchup, which rounded out the burger’s flavour brilliantly. It is ridiculous how succinctly the name of the place describes the burgers they sell. When they arrived, we both commented on how small our burgers were, but their size belies how much is actually there - by the time we’d eaten them, we were both more than adequately full. I’m practically gushing about this place, but honestly, it was the burger of my trip. You know a burger joint is good when a queue forms at 11.30 in the morning. …and I haven’t even mentioned the truffle fries, which were terrific too.